Today was a great day, gente! I walked around all over the city putting post card stacks on places and leaving posters with people at stores. I tried to be as nice as I could, but I could tell the workers were tired, had this “dafuckisthisshit?” look on their faces. I wanted to hug them and say, “Me too, I feel you, been up since 5 am, just please, please don’t throw this poster away.” but I knew that is the last thing they wanted. The rain was going crazy but I got some posters printed! My mission was to hand out as many postcards as I could, and make it to Books Inc on Market(our venue on the 5th!) before they closed, having the posters in my hands felt gooooood. I tried to give as many people as I could on the street (when I encountered dry parts) post cards for the show and tried to tell people who seemed like they were nice, though some folks were very hesitant to take a card. Things I was told when trying to tell people about the show. 1. What kindadamn fool tries to promote a poetry show in the rain? My response -the show is this Saturday, I have no choice! Take this postcard!!! 2. Poetry?….Ew…. My response -You are so handsome. 3. People don’t want poetry on a Saturday night, they wanna get laid! My response -Hahaha, yes, but maybe they’ll meet someone at the show, or the poetry will inspire them to go get their groove on, I have faith in my people (the gays and the latinos and the queers) that this show is going to be great! TAKE A POST CARD! When I finally got to Books Inc, they were more than happy to take the posters. I’m so grateful for them and for their support of their literary community. It was nice to see them so prepared not just for our show but for National Poetry Month. 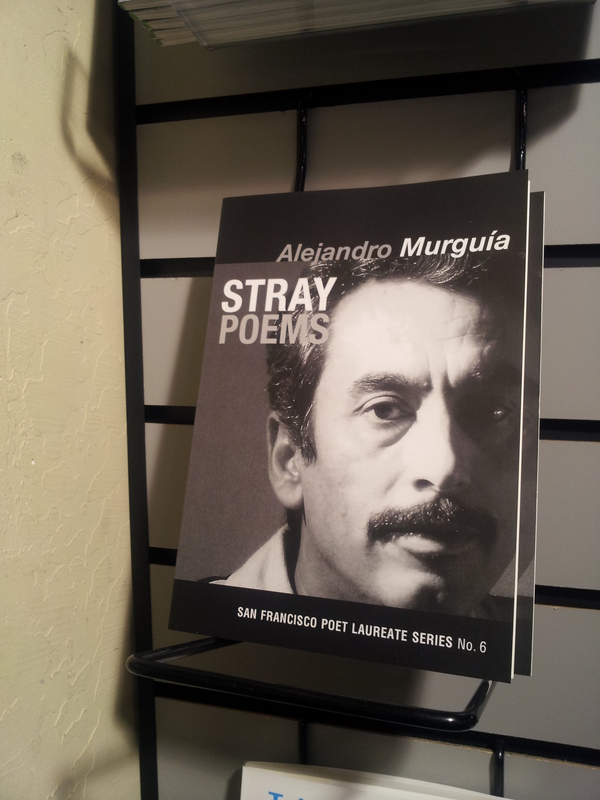 Check out this shiny new collection of poems and they got the Poet Laureate Alejandro Murguía’s book there, ready for our event! So grateful. 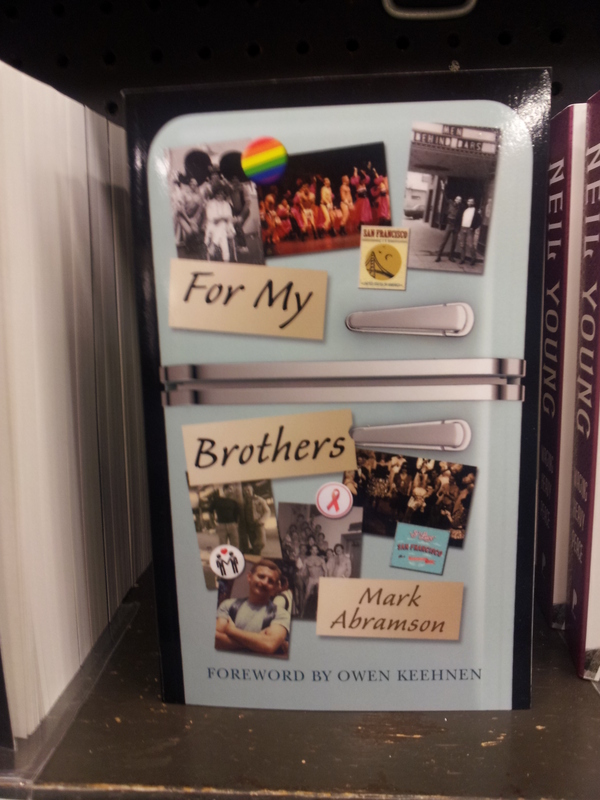 While I was there it was very inspiring to see the huge poetry section by gay and queer writers. I saw some friends, some folks I know, saw the Divining Divas book there and thought of Michael, and James, and Regie and all the folks that have inspired me and supported me. And of course like a true selfcentered writer, I tried to picture my book among the others as well….sigh…someday. A boy can dream…till then I know you are all planning on going to the show! ¿Donde Esta Mi Gente? is coming! Of course I wanted to buy all the books, but I’m working odd jobs here and there and making a tiny tiny paycheck at the coffee shop, so I was not able to buy any books, but, if I had money, I would buy this book. Can’t wait to read it when I can, it is on my list of things I wanna read. So grateful for all the homo writers doing their thing. By the end all the shops and stores that would put up the poster, closed. It seemed like the Castro suddenly got covered with tired uninterested young bitter gay men. The rain got harder and I got chubbytired, so I ended the day, the way a bigboy should, WITH ICECREAM, nenas! Drenched in rain, I ate smiling because I handed out a ton of postcards and told strangers about the show, about poetry, why it is important, and why Latino writers are important. 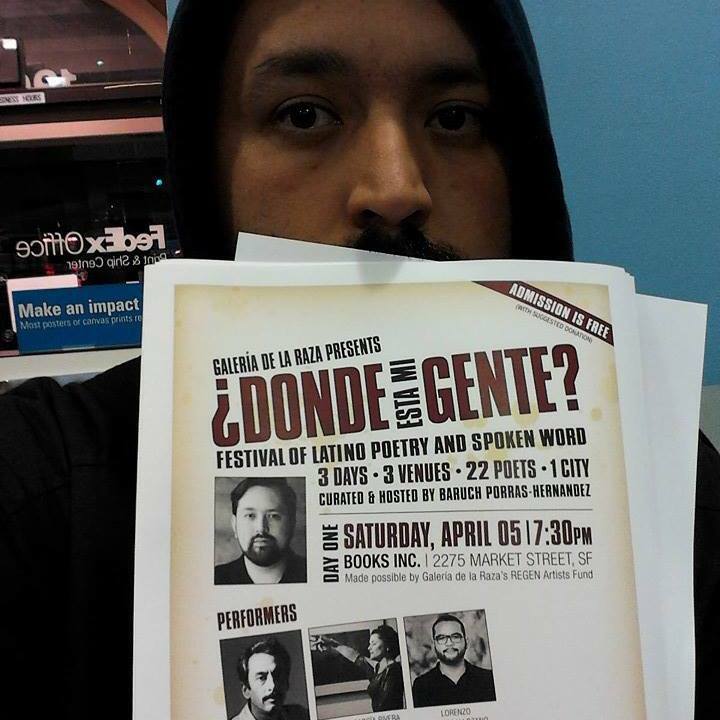 So many people didn’t know that the Poet Laureate of San Francisco right now, is Latino. 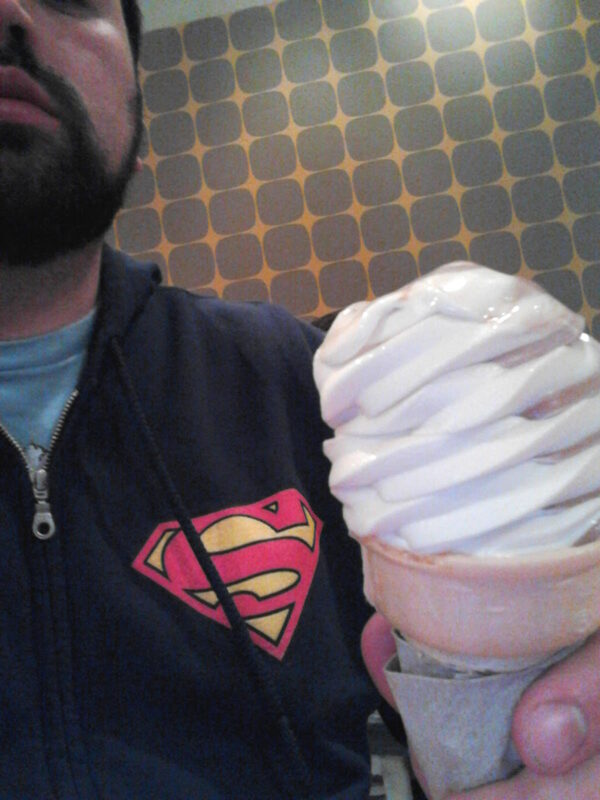 Surrounded by very tired angry gay boys who were all cute, but none of them were smiling, I destroyed that icecream cone! The first show is this Saturday at Books Inc. On Market at 7:30pm, it is FREE! If you wanna help out with the festival, watch this video below and SUPPORT! Coperacha! Coperacha!